3.COLOR : The actual color is lighter than the display image. 5.TECHNIQUE : Digital Printing 6.SUITABLE : Windows, Sliding Doors, Smooth Surface. NOTE: Please allow 5mm error in size as manual cutting. DKTIE products are all Original Design. We develop innovative, custom designed products and solutions-and so shape people's everyday lives. Artscape window films create the look of stained and etched glass. 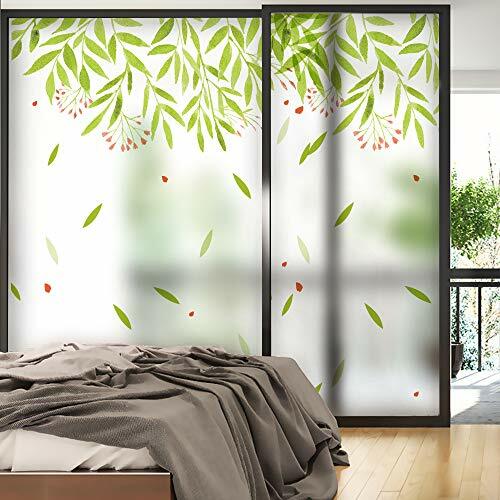 These thin, translucent films provide privacy while still allowing natural light to enter the room. any size window. The images have a repeating pattern left to right and top to bottom and can be used either vertically or horizontally. These films provide UV protection and are the perfect decorative accent for windows that require continued privacy. 1,Clean the window thoroughly & Measure the window size. 2,Measure the Static Cling Film,. 3,Spray plain water generously on film's smooth side,then spray plenty of plain water on the window. 4,Place the wet film on window from the top,Secure the film by squeegeeing from center to edge.Remove all water and air bubbles. EASY REMOVAL: Static Cling Glass Film!Leaving No Residue after Removal and the Film Can Even Be Used Again! MATERIAL&SIZE : Eco-Friendly Vinyl PVC, Waterproof, Thickness Appr. 2mm. If you have any questions about this product by Dktie, contact us by completing and submitting the form below. If you are looking for a specif part number, please include it with your message. Allure Etched Glass Sidelight Decorative Window Film 16" x 74"
Soqool Decorative Window Film for Office Glass, No Glue Vinyl Window Film Sliding Door Decals- No Residue, UV Prevention 17.7" x 78.7"